In a weekend double-header in Madison, the No. 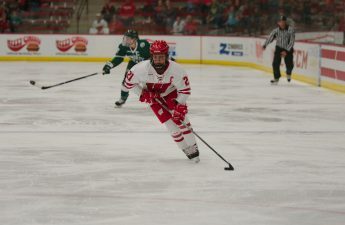 1 University of Wisconsin Women’s Hockey Team showed two sell-out crowds at LaBahn Arena why they are the top team in the nation. The Badgers took on a struggling St. 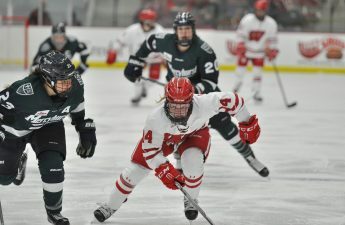 Cloud State University team (4-13-3 in conference with a shoot-out win), but did not relent en route to a weekend of victories. In the first game of the weekend Saturday, Wisconsin shut down the St. 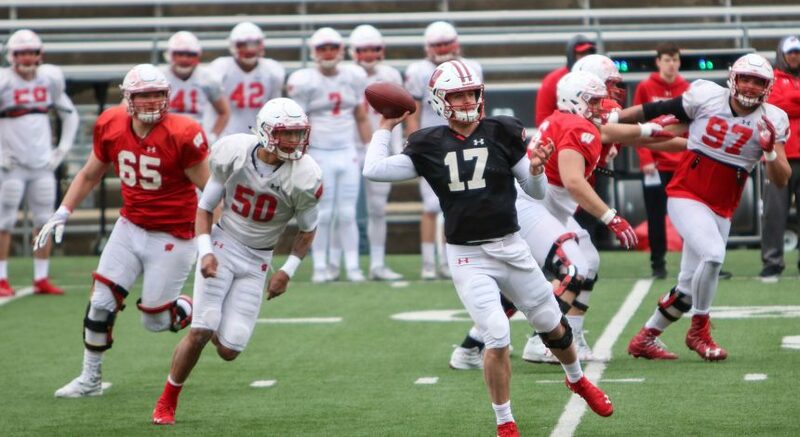 Cloud State Huskies offense. 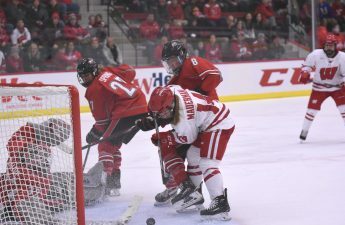 The tenacious Badger defense allowed no goals and limited the Huskies to only 13 shots — and only one in the entire third period. This allowed goalie Kristen Campbell, the NCAA save-leader, to get a bit of a break in net. She played 60 minutes but rarely saw action. The same cannot be said for St. Cloud State goalie Janine Alder. Alder did the best that could have been asked from her. 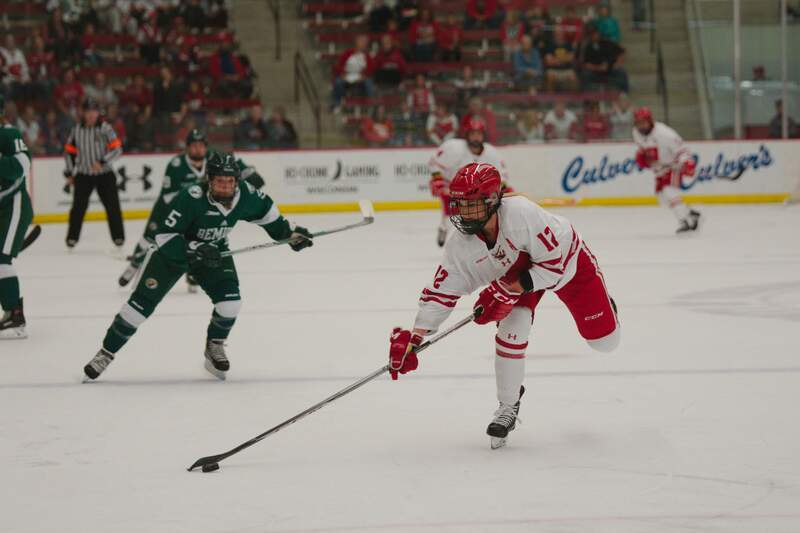 She faced an onslaught of a staggering 57 shots on goal from the bothersome Wisconsin offense. She only allowed four goals and made a still-impressive 53 saves. 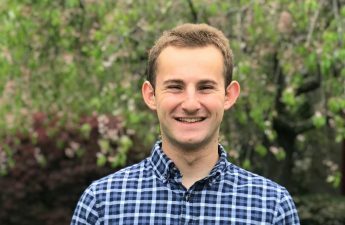 Few would be able to completely stop the high-powered, 3.57 goals-per-game Badger attack. The 4-0 victory was an excellent start for UW Coach Mark Johnson’s team, but things would get interesting come Sunday’s showdown. The second game of the series began without a hiccup. Wisconsin jumped out to a familiar 2-0 lead, and things seemed to be shaping up like another blow-out. Seven minutes into the second period, St. Cloud State ended their scoring drought with their first goal of the weekend. Wisconsin breathed a sigh of relief as defender Maddie Rolfes nailed a goal a minute later to reclaim the two-goal lead. At the onset of the third period, the Huskies pulled back to within a goal. The period raged on as the Badgers defended their razor-thin margin with stellar defense, and only allowed three shots in the final frame. No more pucks found the net in the third period for either team, and Wisconsin escaped unscathed with a 3-2 win. Johnson knew they got away with one Sunday, as they certainly were not playing their best for most of the game. Now the team looks ahead to one of their most anticipated tests of the season: No. 5 The Ohio State University. The Badgers will play a two-game set against the Buckeyes in Columbus. Friday’s game is set to begin at 5 p.m. and Saturday’s puck drop is scheduled for 2 p.m.